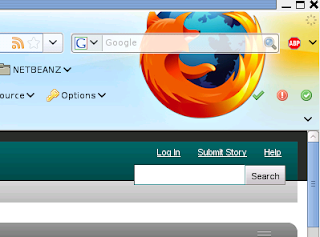 Today i stumbled upon personas, a Firefox extension that provides background images for the symbol and status bars. So you can use skins to have some more eye candy. Here's a little screenshot to get an impression of the look of it. Once you've installed it - there are 3 steps left to do. Now you can click on the little fox symbol in your status bar the choose a skin. Update: New versions of will work properly and don't need the steps mentioned above.